Hey everyone, need some advice. 7 years ago while young and naïve, I bought an '81 Honda ATC 200 out in the country from an older man. I've put a lot of money into the trike, was messing with some wiring and saw the VIN was scratched off. Can't even make a number of letter out of it on the left side of steering neck. This is big trouble if riding on public land without a VIN. And no chance of registering the trike to ride on public land in this state without VIN. I've been riding for 7 years on public land not worried until now. Your best bet is to just get another frame. I don't know too much about this model so perhaps someone else will chime in, but 1981-1983 ATC200/ATC200A should be the same frame. The part numbers are 50100-958-010, 50100-958-020, 50100-958-040. Probably very minor differences if any. There is one one ebay from an 83 for $125.00 but it's in Arkansas and it says pickup only. You'd have to verify that the VIN is there. They turn up, you just have to keep looking. You should be able to get one for under $200.00. Thanks for the response, I guess that's the way I will have to go. Won't be able to go to Arkansas though. I did find a Big Red and 200R for sale about 5 hours away from me that haven't been started in years for $800 for both. I may just go pick those up, make some swaps and trash the VINless frame. Neighbors just may think I'm a little whacko with four 3-wheelers, but worth it. Going from 2 suspension-less ATCS to 2 ATCs with suspension may be a game changer! I assume 250es big red? I like those machines a lot, same with the very similar machine 250sx. What's a 200R, do you mean 250R? If you can get a 250es and a 250r for $800 and they are in any kind of shape (runnable etc), that's a seal. A 250es that moves under it's own power goes for $600-1000 here. The machine isn't totally worthless, you could potentially sell it to someone that isn't going to ride it on public land. Up here in Michigan, there's no registration or any VIN requirements that I'm aware of for riding on state owned land. The only requirement is a couple ORV stickers. The 81-83 atc200s are all very similar, but since each frame is a different part number, *something* changed even if minor like a gusset change. I've seen people say for example the 85 250r and 86 250r harnesses are the same and interchangeable, when in reality the ground point did change. Still compatible, but doesn't go together quite the same. Same story with the 81-83 200s harness, each year had a small change, but for the most part nothing super major changed, only connector ends, the same wire "core" is used for all 3 years when I'm making them. I'm also not super on top of the 200s/185s series machines. Depending how much you have into it vs resale value in your area, I'd debate between selling it and buying another machine or buying a suitable frame and swapping the ton of parts. Maybe it's worth while calling the local police station and just inquire what they would suggest. I'd just say the VIN sticker is missing and you'd like to ride it on public land what would be the requirements. Here in Michigan, you can build like a dune buggy and get a VIN for it to make it road legal. Extremely expensive insurance though from what I've heard and the machine has to pass an inspection to make sure it has everything required to be legal (we have no emission inspections or anything, so pretty unique requirement for here). Can you post a pic of the VIN area? If you can see it was clearly ground down to hide the VIN number, that would suggest the machine was stolen and you'd probably have a hard time if you ever got caught on public land with it. If it's just a sticker peaked off, or the frame was repainted and you can't read the stamping any more, I doubt it's a super huge deal. Every state has different laws, so I'm not really qualified to really suggest much since I'm from Michigan and of course not a lawyer etc. Either case, good luck with whichever solution you decide to go with. Thanks Ps2fixer, the trikes were an '81 Honda ATC 200S, and a 200X. I don't know why I put R, but it looked like one. I think it's been modified a bunch. Anyways, they are over 5 hours one way away, so I am just going to have a frame delivered. I need to find out what would be an exact fit though. I assume all '81 - '83 Honda ATC 200 frames without letter would fit. But what about 200S, 200X, 185, 185S? I know the S had smaller wheels, but were the frames the same? The other question is the frame bought online will come with a bill of sale, but probably only lists the frame on the bill of sale. Is this enough to register a complete ATC? The frame is the VIN number used in registration, but wondering if a bill of sale for just a frame would be fine enough to register? A bill of sale for the ATC is all that is required by law, but this would be for just a frame... thanks everyone in advance that can help! Can't really same much for your state on frames and bills of sales. Up here, I can relate it to like car/truck, or more exactly a T100 at a shotty dealership. Went to look at a one owner 100k mile ~1997 Toyota T100 and when we got there the truck looked pretty awesome, poped the hood and omg what a pile of crap, everything was rusted to hell and looked horrible. Had a friend with us to run the VIN number and he used the VIN in the window, came up as having a wreck in another state down south (explains the clean body), but when we looked at the title, the VIN was wrong, but it was the One owner VIN, no wrecks recorded etc. The VIN number for a car/truck is based on the body instead of the frame from my understanding (the cop always looks at the VIN in the window, and/or driver's door jam) and he didn't have the title for the body. We walked on the situation since the guy started calling me and my friend names because we were pointing out all the flaws (repainted front end etc) and my dad was the buyer and he has a better eye for that stuff than us, he was just being quite about it. Anyway, after we left we came to the conclusion, the one owner truck was probably a high miles rusty body truck with 300-500k miles (trans wasn't very smooth, had a heavy vibration in it and had a clunk in the rear end when reversing), and the body was likely from a junk yard and the put the nice body on the high miles frame, body had the 100k miles, the engine/trans/frame had the million miles or whatever. Anyway, up here for a car, VIN number is everything, so buying a body you need to get a title with it. The title counts as a bill of sale in my state. Also for the bill of sale to be a legal document, it needs the buyer and seller's address, signatures, and the vehicle's VIN and description (year, make, model, color etc). I generally add in that it's sold where is and as is with no warranty. In other words, if you get a frame, make the bill of sale just like it would be for a whole machine, since it's that machine, just all the extra parts pulled off. Some frames have titles, so if you can get one like that, that would be ideal, but each state has different laws relating to titles. My dad bought his T100 from NC (same shopping spree as the other dealership above lol). To sign the title, it had to be performed in front of some special qualified person, can't remember what exactly. Amazingly we found one at like 11pm and was able to travel home all night. Hopefully this clears up a little bit of the mystery about what you need. Also the 200 series engines all used the same basic bolt pattern for mounting in the frames. People put 200S engines in the 200X frame all the time. The main problem is the 200x kick starter side is a bit of an odd design. I think it was the rear brake lever attached to it too or something like that. The 185/200/x/e/es/m should all fit the engine purely based on bolt pattern. Of course shaft drive vs chain would be a problem, and wire harness lengths/connectors might not match up from one machine to the next. If you really wanted, something like an XL200R motorcycle engine would probably fit in the 200 series frame too, since it's also a 200 series engine. There's fairly modern bikes that still run the same basic engine, not sure if Honda ever changed the engine mount locations or not though. I resell some 2002 XR200R parts from Honda for the older 3 wheeler engines. So far no issues, but it's only one part currently. To shorten that up, the engine will physically fit in any 185/200/185s/200s frame from my understanding, but it's all the extras like fenders etc that I'm not sure what would work and what wouldn't. The front ends are fairly universal too, main difference is neck height and there's only 2 or 3 differences between the Honda 3 wheelers I think. The stops might conflict on some machines (front vs rear side etc). Anyway, like I said before, the 200 series is a bit of my weak area, so it's possible I have something wrong. I mainly worked with 200es's and 250cc+ machines. I found an '84 200S frame for a decent price with VIN, but I've also read that the S version had smaller wheels and the fenders don't match up. The 200S had 1 piece rear fender, while mine are 2 piece. I read the same with the 185 that some parts won't match. So I think I'm screwed since I will be swapping every single part on the frame. I've yet to see an exact '81-'83 ATC 200 (no letter) frame pop up on Ebay for a decent price and not $350. Does anybody have one to sell? Or know what other machines/years would be an exact matchup? Well the wire harnesses year for year match for ATC185S vs ATC200 for 81-83, so maybe the frames are nearly identical? As far as fenders go, rear fender firts 81-82 atc200, same with the front fender. Front forks are listed as 81 only, but I'm 95% sure your forks would bolt up to atleast 81-83 atc200 frames. Just poking at a few more parts, air cleaner fits 81 + 82 (and 81 185s), same with the chain guard cover. Oddly the rear axle interchanges with 80 atc185 & 81 atc200, pretty sure the rear axles are fairly interchangeable though (the axle housing fits the same machines). Tool box at the rear fits 81-83 atc200. Besides the rear axle stuff, it looks like 99% of the other parts will swap over 81 to 82 ATC200 frame. 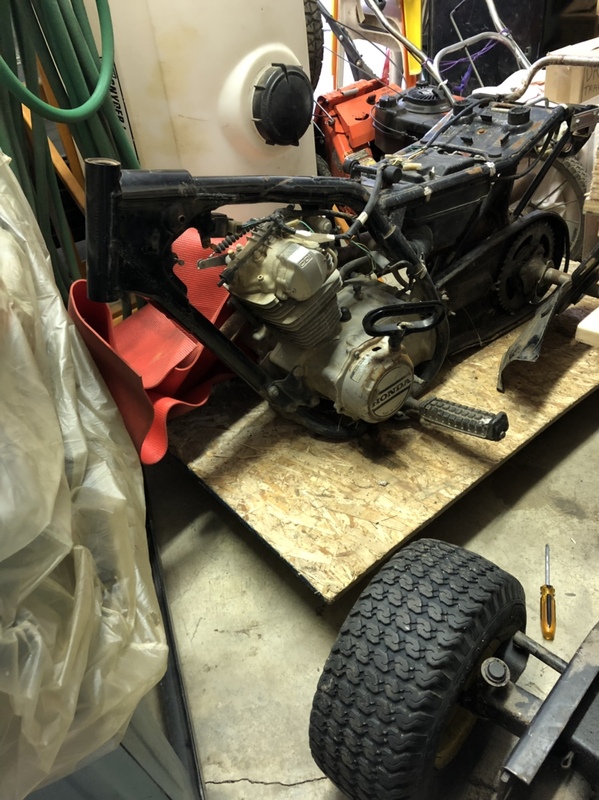 Seems like the best option would be to find a cheap parts machine and swap plastics and engine after repainting the frame if needed and replacing/upgrading bearings where needed or desired. The S frame is narrower than the ATC200 frame. They’re not a direct swap. If you have good fenders for an S frame, all else swaps out pretty straight forward. I have an S frame with an ATC200 engine on it right now. Oh also forgot to mention, here's the wiring differences per year too. Little side project of mine. Kind of funny no one has commented on it yet, I know it's useful though, heck I use it a lot already. 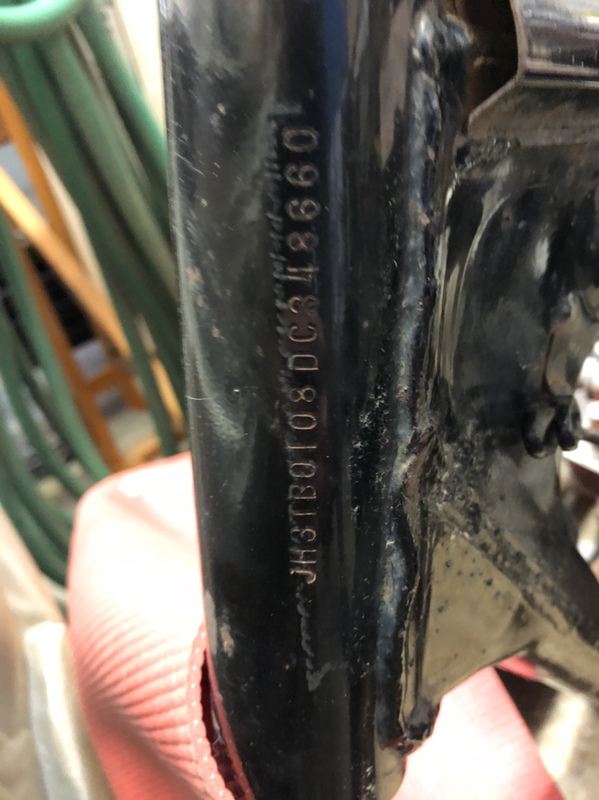 Im pretty sure that the VIN should be stamped on the frame somewhere else.......I always thought it was stamped in at least 2 places???? Maybe I'm wrong.....I'll have to look at my 200M. Gabriel, so if I bought an '84 200S frame, it would work with all my parts for the '81 200 besides the fenders? I do not have the tool box inbetween the fenders, just 2 separate fenders for right and left. Do you think these would bolt on or I would need new fenders? If I need to buy the 1 piece fender for an S it wouldn't be cost effective, may just need to wait for a 200 regular frame to come along. What do yall think? If you want it, I’ll get the engine out and send it the end of next week. Not sure what shipping would be from N. Idaho, though. I think it’s an ‘83 200, if I’m remembering it correctly. I'm not going to suggest anyone break any laws, but if I knew a bike was clean but didn't have numbers for some reason (no idea how that would ever happen and it never has to me), I might be inclined to stamp a clean set of numbers on it and call it a day. In a completely unrelated situation, there's a 200S neck in my back yard that's never going to need numbers again, I cut the frame up.